This Irish angel features a garden stone with a bereavement blessing. 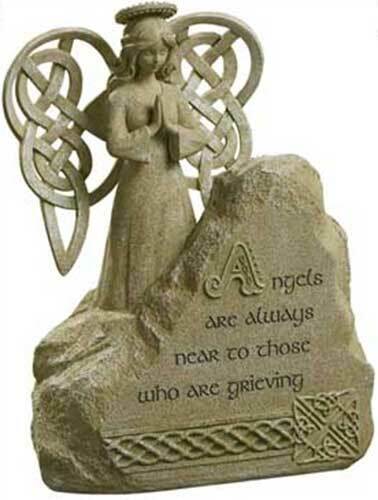 The Irish bereavement angel is enhanced with Celtic knot wings along with embossed knot-work on the dimensional stone. The Irish garden decor is made of cement and resin and measures 8 1/2" wide x 11 1/2" tall x 5" deep. The Irish garden angel is gift boxed with a Celtic knot history card, complements of The Irish Gift House.